Normally. I draw the cover art before we start the page art at all, but we thought we’d try something different this time and get a better sense of the book and then do the cover. All of the covers feature Salamandra doing some sort of magic (the keen-eyed among you will have noticed) So, as Nimue and I were walking and discussing possibilities, Nimue said: “I have an idea, but it’s a bit silly”. I knew we were onto a winner at that point. We have not shown Sal doing fire yet really, so Sal looking epic while heating a kettle for tea was the perfect solution. This means we get to include magic, devices, Sal and perhaps most importantly, tea. Here we are at the pencil stage. 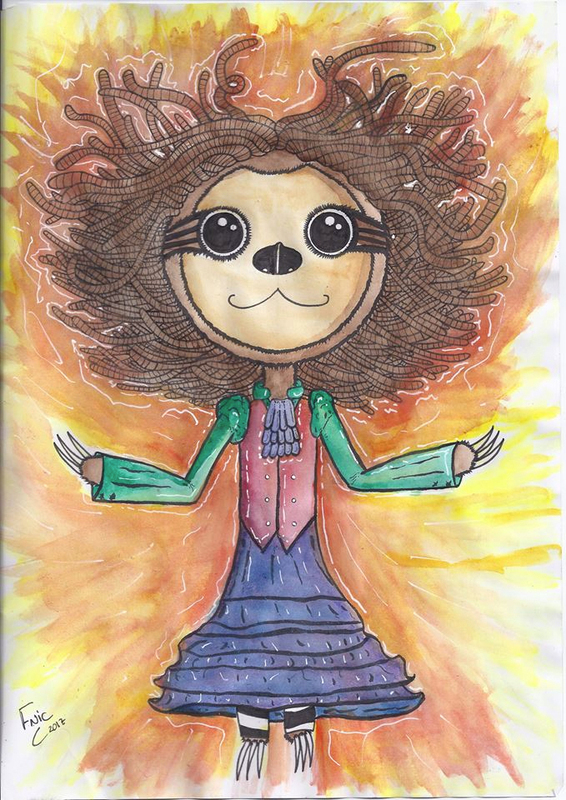 Nimue has just started on the hand colouring and we will be passing the finished thing to our lovely publisher (Sloth!) before long. All being well, Victims will be in your hands, claws or tentacles late spring/early summer. 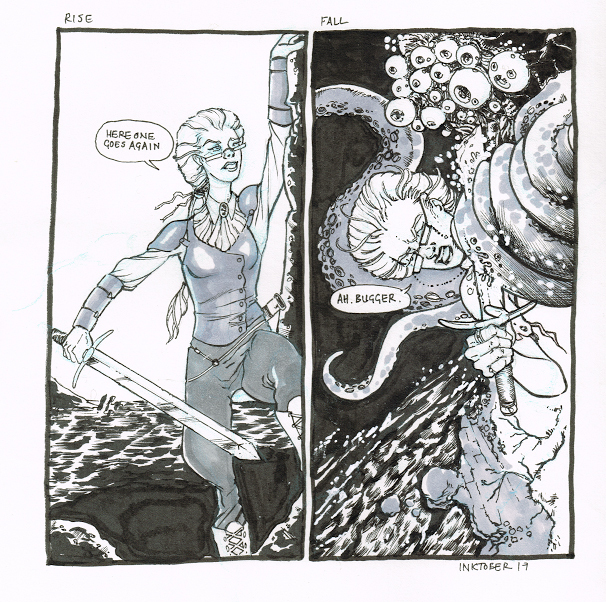 I’m greatly enjoying drawing the page art and being more collaborative with Nimue on the art as well as the story is an absolute pleasure! Until next time, I hope this finds you all well, inspired and thriving. 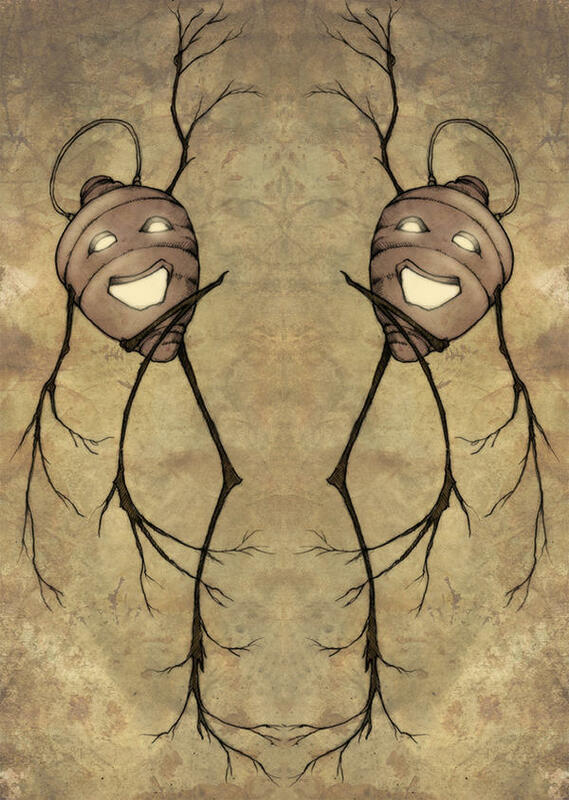 Hopeless, Maine: the holiday destination for the discerning traveller! This allows us to talk about Timequake ! This is an event in Manchester in March 2018 which will have many steampunk (and similar) environments, events and oddities all under one roof. 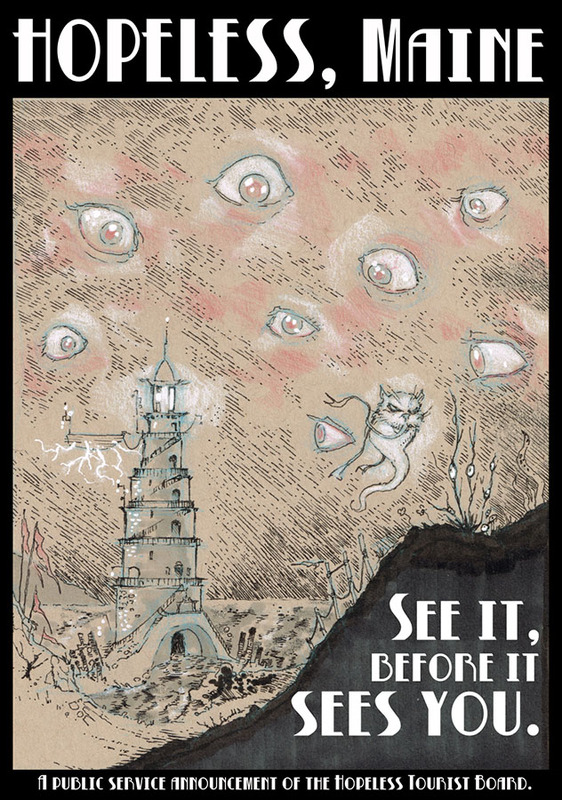 (I’ve not heard of or attended anything like this before) We are pleased to say we will be part of it *and* that we will be stationed at al actual Hopeless, Maine tourist information booth (next to the tea museum as I understand it) There are rumours of twelve foot tentacles. It would be a great understatement to say that we are excited about this. There will be photos, no doubt. As always, we hope this finds you well, inspired and thriving. I shall tell you a brief story and then we will move on to other things if you are willing. (Your unwillingness would be expressed by not reading any further, I suppose, but you will be rewarded by sticking with me for a bit) I met the esteemed Mr. Eckhardt many years ago when I still lived in Maine. He and I were both (as it turns out) illustrators for the same Lovecraftian publications and I had been an admirer of his work for ages. We met (on a Thanksgiving, as I recall, many years ago) and became fast friends. 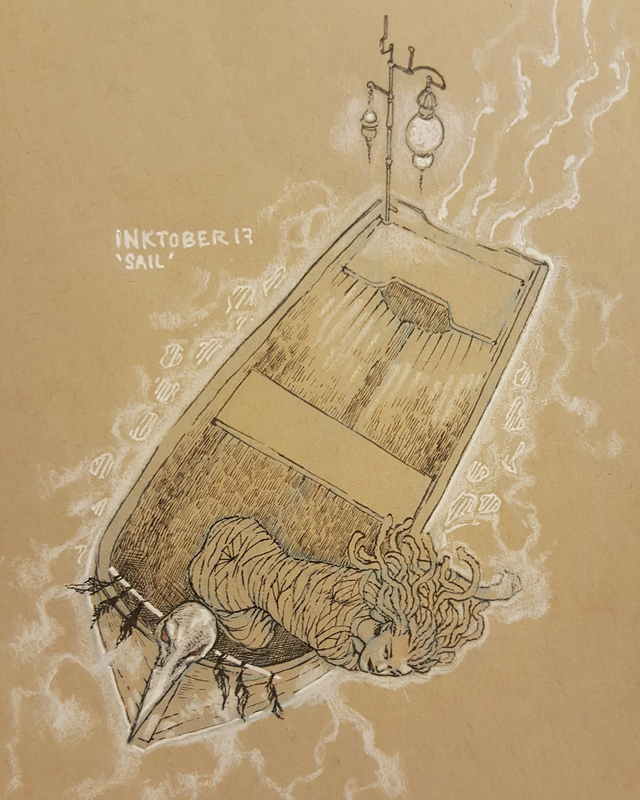 He is one of the best pen and ink illustrators I have ever encountered, and his work suits the eerie and weird to an uncanny degree. 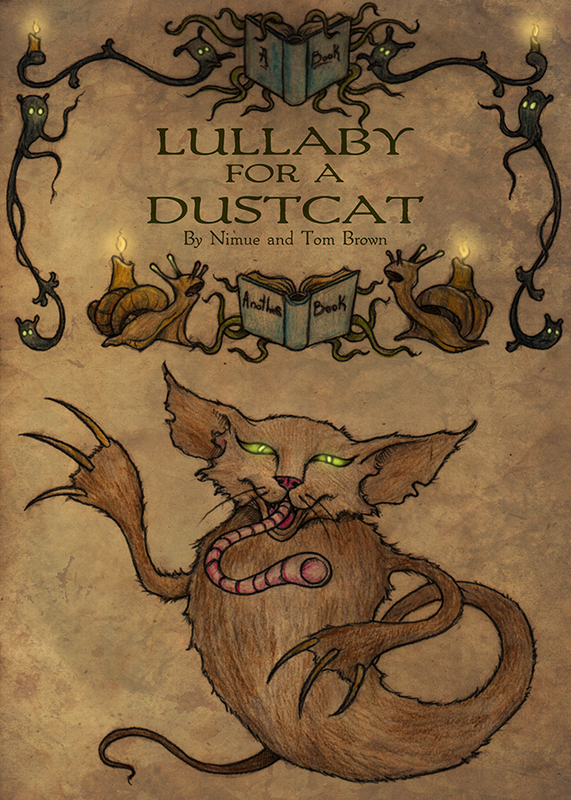 When it came time to have a new masthead for Hopeless, Maine, I knew the chap I wanted to do the job, and, bless him, he said “yes”. 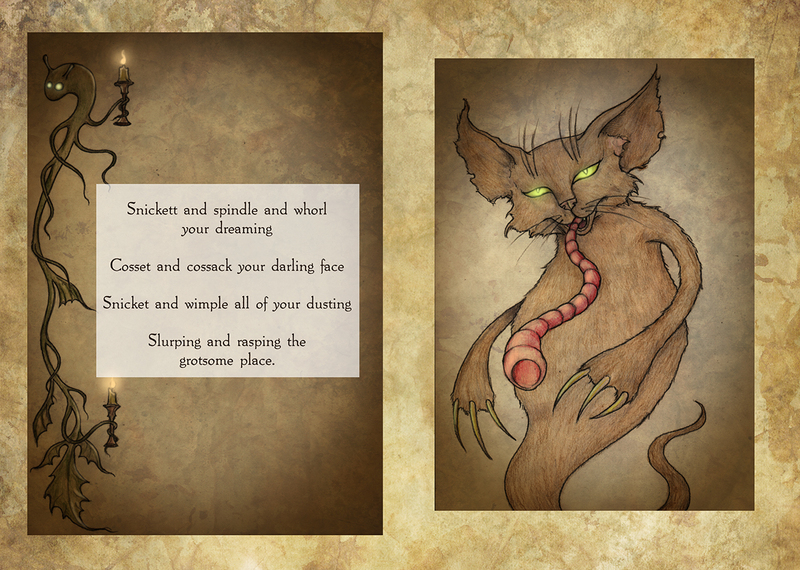 Here is Jason’s design for the masthead for Hopeless, Maine in all its glory. As you can see, it’s perfect and better even than we had hoped. As Jason had designed this, we thought we had better send him a copy. 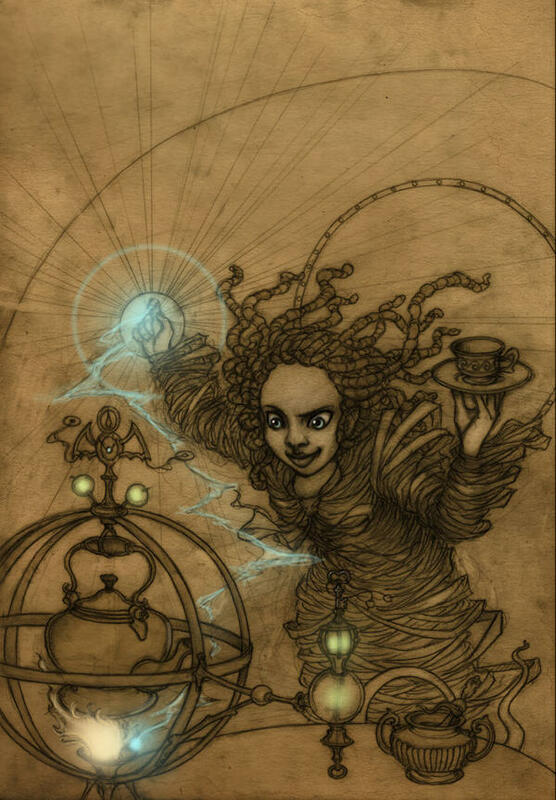 (the very least we could do) and the following is his response and review of Hopeless, Maine- The Gathering. To my delight, all of the things I was hoping were there to find, he did find. His review follows. “I’m prejudiced—I admit it. I have been an admirer of the artwork of Tom Brown for many years now, and I don’t care who knows it. 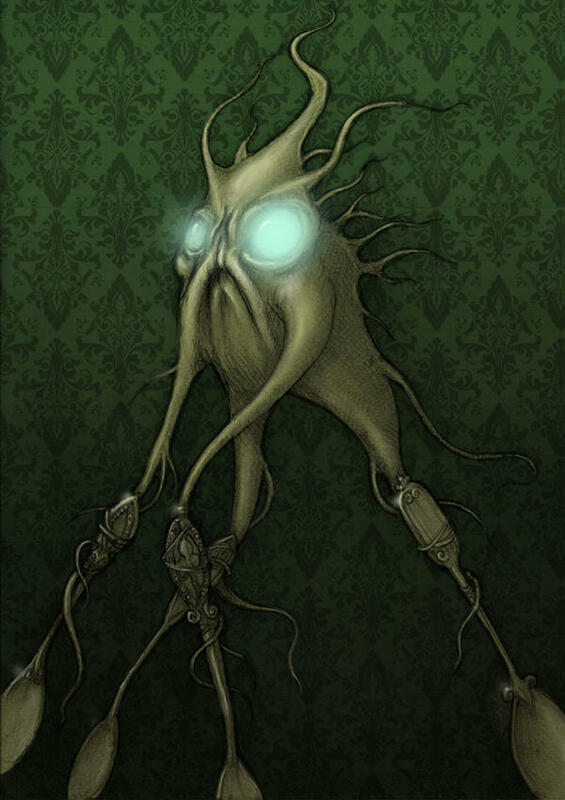 But even that fore-knowledge didn’t prepare me for the depth and weird beauty of “Hopeless, Maine—The Gathering”, the graphic novel/ saga Brown co-created with wife Nimue Brown. 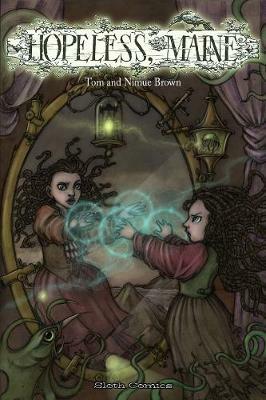 “Hopeless, Maine” is really an omnibus of three volumes following the adventures of the girl Salamandra in the fog-shrouded town of the title. But this is no town you will find in the Maine Atlas, nossuh. Rather it is as if some characters escaped from the manga universe took a wrong turn on US Route 1 and ended up in Edward Gorey’s backyard. There is a perennial fog covering the town of Hopeless (on an island? Or one of the many scrawny peninsulas of the Maine coast? ), and it seems to hold the inhabitants there in a perpetual state of dusk and gloom. In a word, hopeless. But there is a spark in young Salamandra that won’t be extinguished. She begins as an orphan in a large, empty house littered with dismembered toys, cobwebs, and unfinished magical experiments left by her absent parents. A kindly local witch, Miss Nightshade, takes Salamandra to the local orphanage. There she befriends a crow and a boy, Owen, and acquires what is possibly the worst “invisible friend” in literature (who, through the brilliant irony of Tom and Nimue, is made the most doe-eyed and manga-esque waif of them all). Meanwhile, things—some like bits of seaweed, some like jumbles of bones or brass fittings—float by in the thick, yellow-grey murk, sprouting eyes that regard both the characters and the reader alike with a terrible blandness. There is also a tree of bottles. None of these things is explained—they simply are—which is much of their outré charm. There is more, much more to this book than this, but I wouldn’t want to spoil it for you. 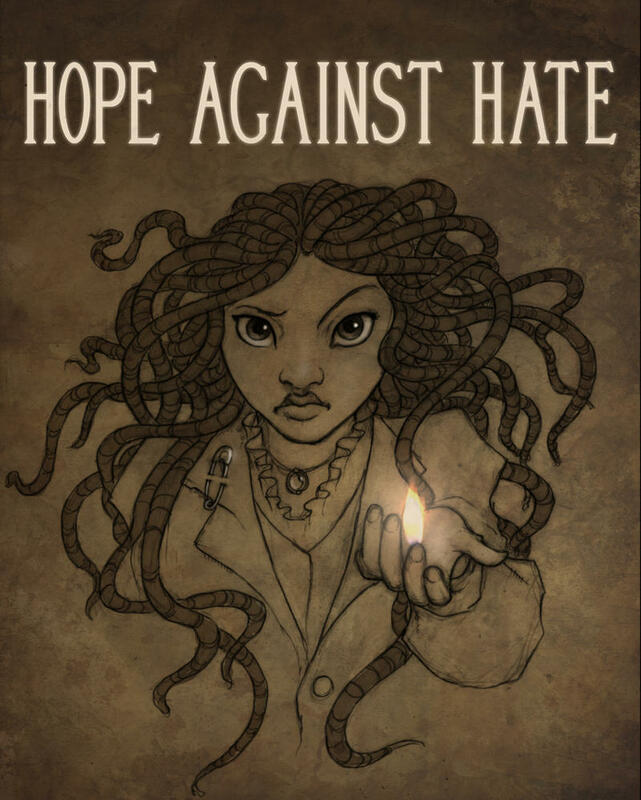 Reading the Hopeless saga is a continuous revelation of beauty and strangeness. It is a story that requires constant attention, but rewards that attention a hundred-fold. Clearly, Tom and Nimue had a clear vision of their story and its heroine, and remained faithful to that vision throughout. 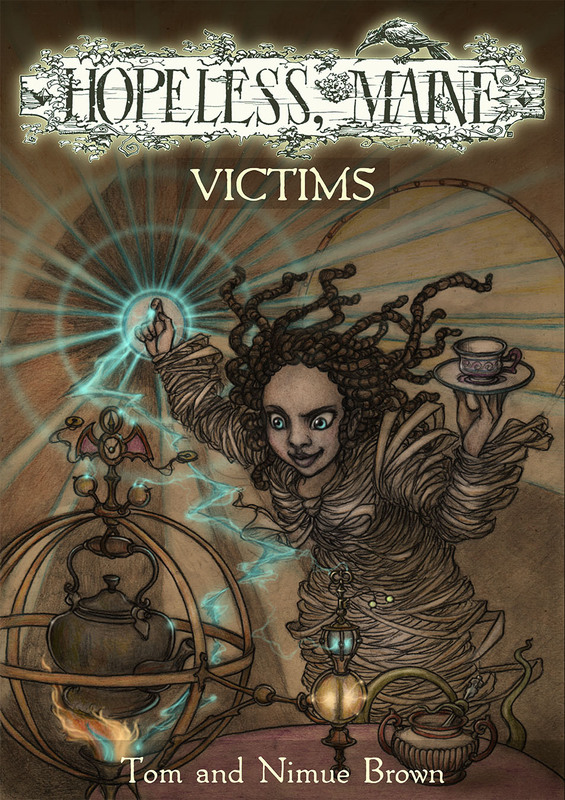 If I have any criticism of “Hopeless, Maine—The Gathering”, it is with some of the type. The text in the “Prelude” is rather small for my old eyes, and title-headings are similarly insignificant. This makes the jump from chapter to chapter a little disorienting at times. There you have it! We mostly use the Vendetta as a source of entertainment, and not to (directly) promote the books, but we thought this was well worth sharing. I hope this finds you well, inspired, and thriving. The Hopeless, Maine arts and crafts movement. This is a rather grand title for a thing that we are doing. We are combining the philosophy of Wombles ( “Making good use of the things that we find, things that the everyday folk leave behind”) and a cottage industry/arts and crafts movement. It began because we are having a week-long exhibition as part of the upcoming Stroud Book Festival. We thought it would be much more interesting to create a Hopeless, Maine environment than just to have pictures framed and stuck on a wall. (There will be those too, but the things we have done to the frames make them the sort of thing you might actually find on the island in a home) All of the best things we have made so far (I think) have been things that Nimue and I passed back and forth, so it’s great fun to find a new sort of collaborating for us too. In the photo above, there is a thing that we are still not certain is a bowl or a pet, though we expect it needs regular feeding in either case. We’ll be talking more about all of this closer to the event, and as we Womble further. 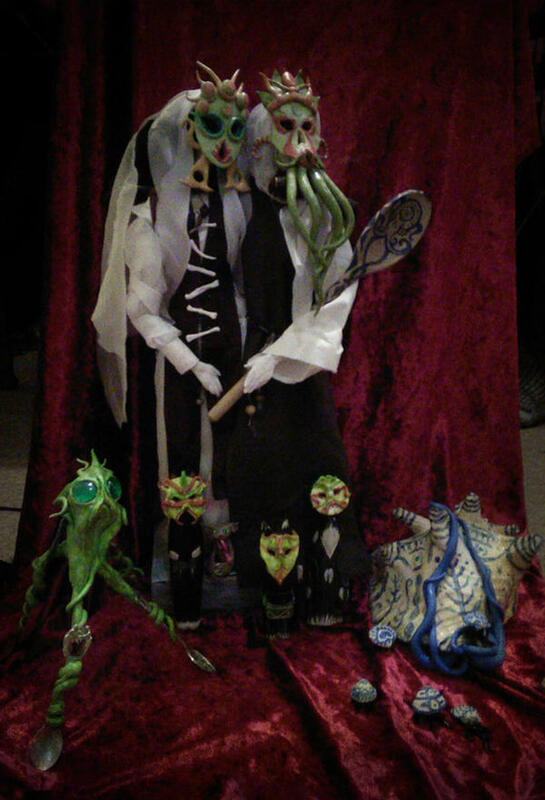 The Hopeless, Maine arts and crafts movement is go! See the fluffy doom! 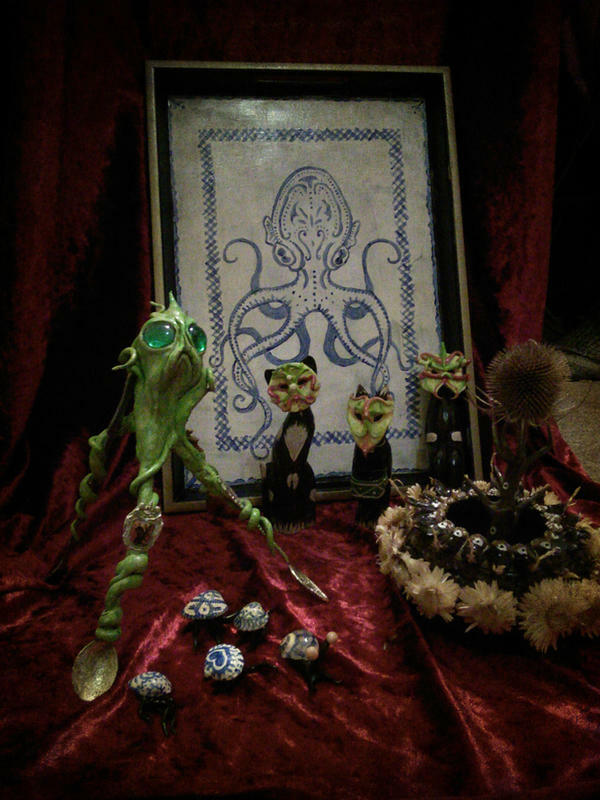 We are preparing for an immersive Hopeless, Maine exhibit this Autumn, and are making sculptures, Painted trays (Hopeless, Maine willow pattern!) and now, this fluffy taste of doom- The gravestone skull rag rug! The design is based on the skull motif found on New England slate gravestones. Nimue has made this because she is a genius and made of gothic win (and dark puppies) Below the back of the rug of doom, as it shows how it was done, and also looks rather like a grim mosaic. As you can see, he is a modest (and busy) sort of chap. 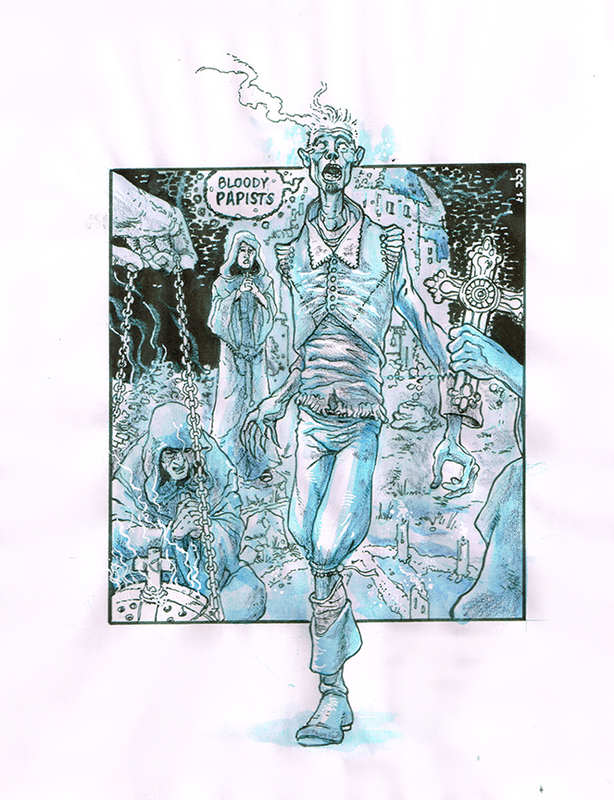 Without further ado, here is his image of Obediah from a recent episode of Tales from the Squid and Teapot.